The best water view in Door County? You bet it is! At Egg Harbor Lodge, we brag about having the best water view in Door County but actually, we aren’t bragging, it’s a fact. Our water view of the bay of Egg Harbor is spectacular from all of our 25 units. Most of our guests plan their evening around the sunset. In our office, we have a sunset clock that we set every week to coordinate with the sunset. We set it fifteen minutes early so our guests know exactly what time they will need to be back from dinner or know what time to go in order to catch the sunset. Many times after “our” beautiful Door County sunset, guests will spontaneously applaud… one of life’s simple joys. Cocktail hour is definitely a big attraction. Guests make cocktails and sit at our patio tables, Adirondacks or mostly on their private balconies and take in the silence and beauty of a Door County Sunset. As an adults only facility, Egg Harbor Lodge is so peaceful that at times, you can hear people talking aboard their sailboats out on the bay!” Don’t get me wrong… our guests have fun too! 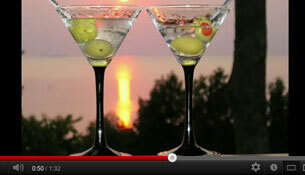 Our sunset cam is a new addition to our website. Anyone can check out the Door County weather or sunsets (or Mark mowing the lawn) from the comfort of their own computers at anytime. 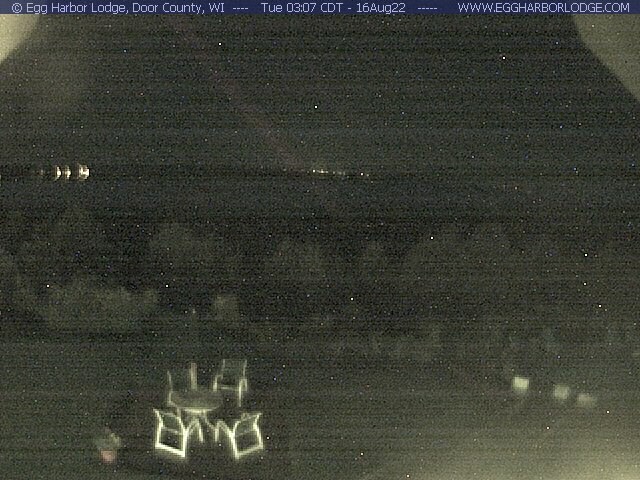 If the weather is clear, you can see the lights from Marinette, WI and Menominee, MI at night. 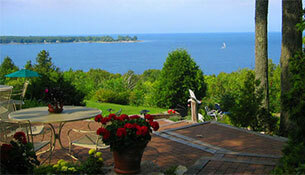 So, if you are looking for lodging centrally located in Door County with a phenomenal view of the bay, look no further.